The roster of McKim, Mead & White's clients reads like a who's-who of American business, professional, cultural, and social enterprise in the late nineteenth and early twentieth centuries. Many of the buildings designed by this distinguished New York firm still stand today — libraries, museums, churches, train stations, banks, office buildings, private clubs, and residences — an imposing testament to the splendor and durability of its achievement. This magnificent pictorial history is one of the most important documents in the history of American architecture. In 435 superb photographs and over 500 line illustrations, including both floor plans and elevations, it surveys over 160 structures designed by the architects of McKim, Mead & White. Originally published in four massive volumes and now available in an unabridged one-volume paperback edition, this handsome book depicts such famous New York City landmarks (present and former) as Columbia University's Low Library, the Pierpont Morgan Library, the Municipal Building, the second Madison Square Garden, and the original Pennsylvania Station. Other major landmarks include private and public buildings and other structures in Boston, Cambridge, Newport, Providence, Princeton, Philadelphia, Washington, D.C., Chicago, and Montreal. For architects and architectural historians, this book will be a valuable source for its comprehensive views of an unrivaled achievement in American architecture. Social historians and students of Americana will find it revealing for its reflection of the ideas and culture of the times. 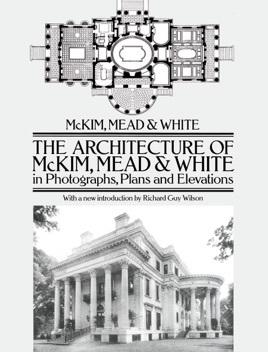 A new Introduction by Richard Guy Wilson perceptively appraises the McKim, Mead & White legacy for today's readers.